While the first nine holes are surrounded by numerous tall rubber trees, the back nine holes are grounded by the In-Land mountain atmosphere. Overall, WGP drawns together a variety of remarkable designs : wide, narrow, left-right doglegs, inclining and declining fairways; huge and tiny water hazards, locating in front, on the sides, and at the back of T-offs/Fairways/Greens; deep, shallow, short and long bunkers; spacious, speedy and sloping greens. 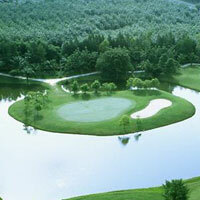 The golf course itself is also an opened zoo, where animals naturally reside by their own habitats. By uniting all possibilities and accessibilities, required for a World Class golf course, Wangjuntr Golf Park is the only place that golfers will enjoy a new era of golf, and that golfers will remember a superior distinction from other golf courses around the world.